So I brought you guys through pumpkin season and now we're gonna just glide right into what has to be my favorite season of all – EGGNOG SEASON! If they sold eggnog year round I'd be the person buying it every couple days. Can you believe we are 21 days away from Christmas? On a recent run to Kroger while grabbing a few gallons of milk, (you don’t even wanna know how fast we go through milk), I realized that Eggnog is now on the shelves. I was so excited I may or may not have broke out in a dance. It is officially Christmas time!! I'm sure you have started getting at least a few of your Christmas party invites. Leaving you to figure out how you will top last year's ugly sweater, what gown to wear for the formal gatherings (if ya fancy) and what dish to take to one, if not all, of the party's. One thing you may have forgotten about in all of the holiday bliss is that as the seasons are changing and the weather is cooling down, we have not only entered holiday season. But we have entered germ season too folks! 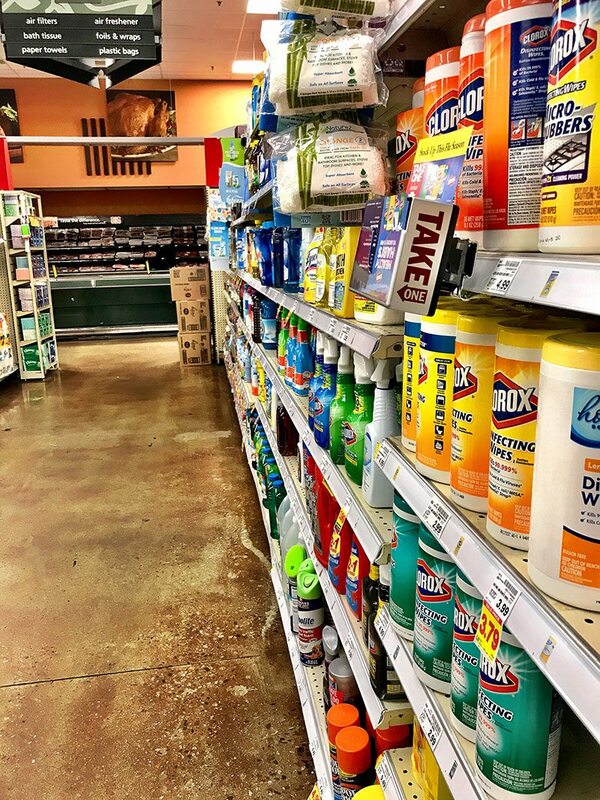 So with this realization, while in Kroger, I was sure to head over to the cleaning and medicine aisles to grab some of my favorite products to help manage or mitigate germ season altogether. It never fails that as the holidays approach, at least one, if not more, of the Hampton crew are fighting something off. Leaving me to have to quarantine them stock up on treatment remedies and clean a little more to fight the germs that make their way in. All in effort to save the rest of us from suffering. This stuff is a gift straight from the heavens. It helps to fight off the symptoms of sickness and get you back to feeling normal in no time. When either my husband, daughter, or myself get caught up with those nasty germs we always reach for this, it’s like power of a prescription without going to the Dr.
No one has time to be stuffed up and uncomfortable. TheraFlu let's you be a good person throughout the day. Lol. I just got hip to this stuff last year. And I am not happy cause y'all been holding out on me. I have to admit that I am the one that usually gets caught with a cold sore in the winter months. This stuff changed the game for me. It starts working instantly at the onset of symptoms to help heal your cold sores. My nephewson is my one that inevitably gets bit by germ season every year. Every. Single. Year. And because he is asthmatic, I have to be sure to nip it in the bud. TYLENOL® helps to treat the symptoms associated with the illnesses the little ones get attached to during germ season. These things are awesome because they help me to disinfect and keep the house clean and prevent the spread of germs. 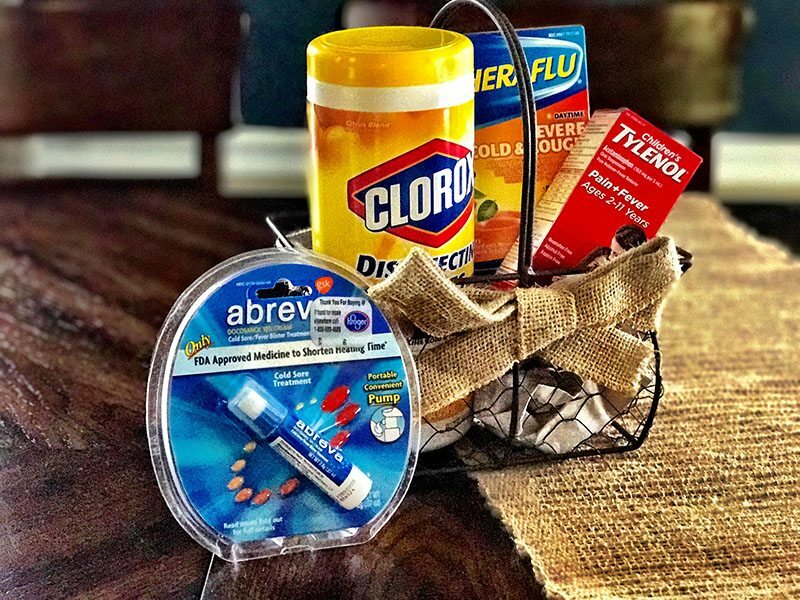 This helps keep the rest of us in the house dodge those nasty germs that snuck their way in. I want you to enjoy your holiday season and time spent with family and friends without passing out and receiving those nasty germs. 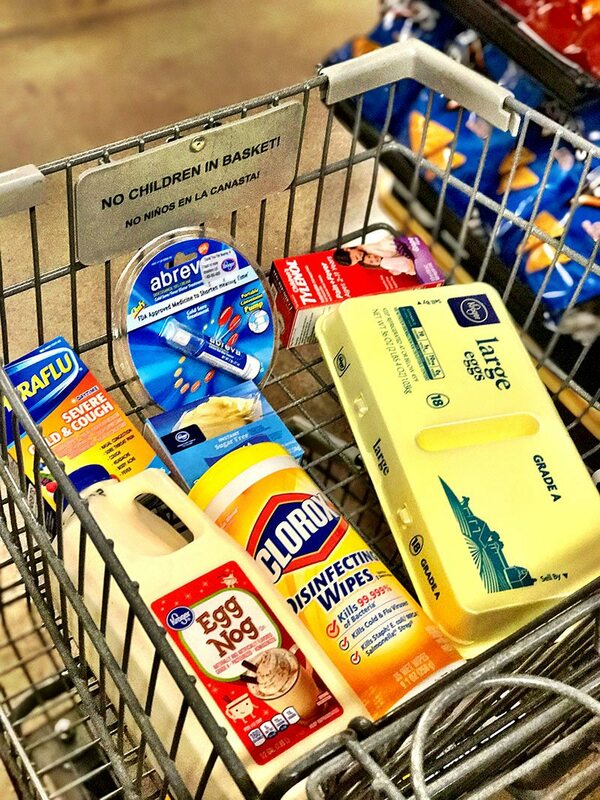 Be sure to stock your cabinets with some, if not all, of these to make sure you are prepared. 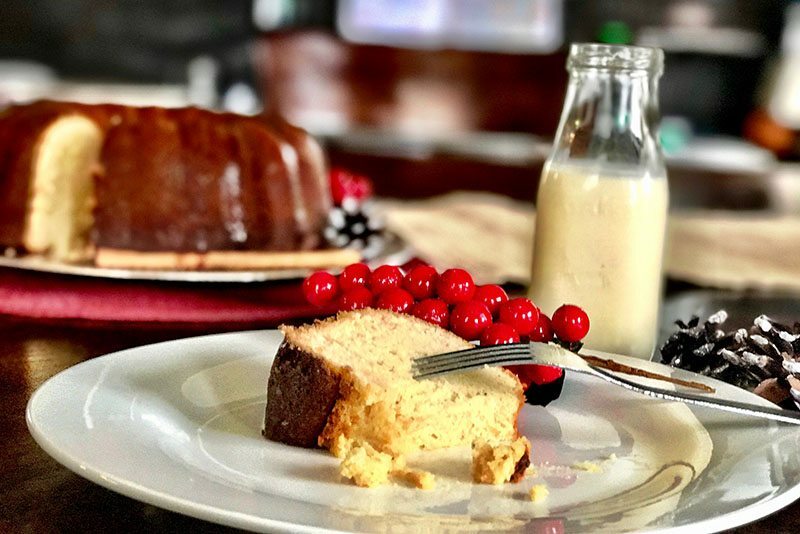 In addition to that, while you're out you'll wanna grab the ingredients for my Eggnog Pound Cake! Unlike the germs, this is something people will want to see you coming in the door with! With the rich taste of eggnog, in this moist fluffy pound cake they'll be making requests for next year. Granted you don't bring any germs with you! Drizzled with a rum drizzle, it’s the taste of the holiday season. A gift in the form of food. 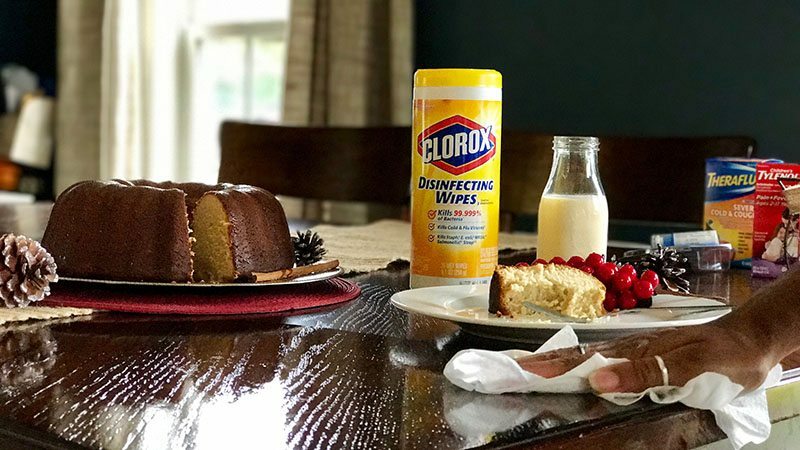 So here's how you make sure you are ready for holiday and germ season and enjoy it to the max! 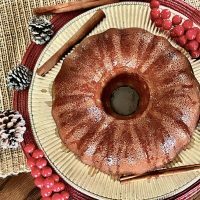 A delicious holiday favorite that combines eggnog and pound cake and delivers a savory treat. Combine pudding mix, flour, cornstarch, baking powder, cinnamon, nutmeg. Set aside. In a mixing bowl, mix together butter and sugar. Add in eggs and mix until well blended. Mix in eggnog and vanilla. Mix in half of dry ingredients mix. Once blended in, combine remaining mixture. Mix thoroughly. Place in heated oven and bake 55-60 minutes or until toothpick inserted in center comes out clean. Remove from oven and allow cake to cool for ten minutes. In small saucepan, combine butter and brown sugar for drizzle. Once melted, whisk in rum and cream. Whisk until it comes to a boil and remove from heat. Transfer Cake to cake plate by place plate at top of cake pan and turning over. Drizzle warm cake with rum drizzle using a spoon. 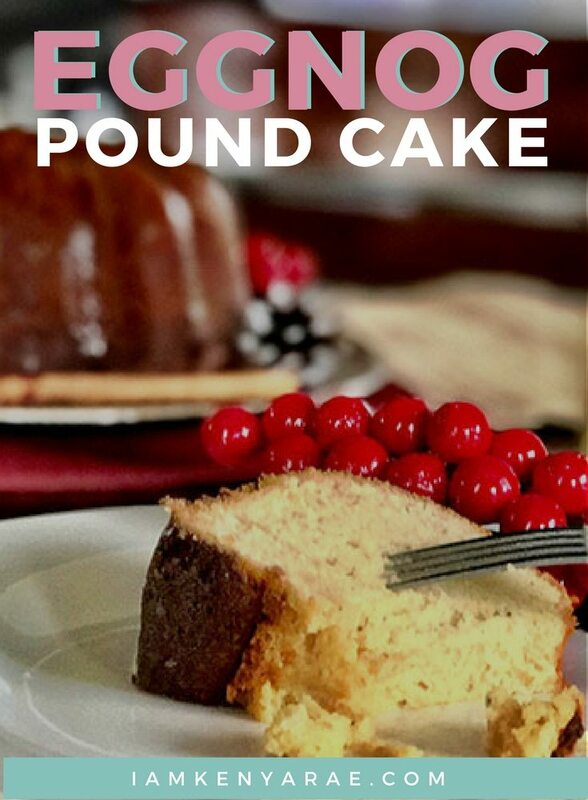 Interested in making the Eggnog Pound Cake later. Hit the pin button below! Consumer Inc. 2017. Use products only as directed. The makers of TYLENOL® remind you to use only one medicine with acetaminophen at a time. 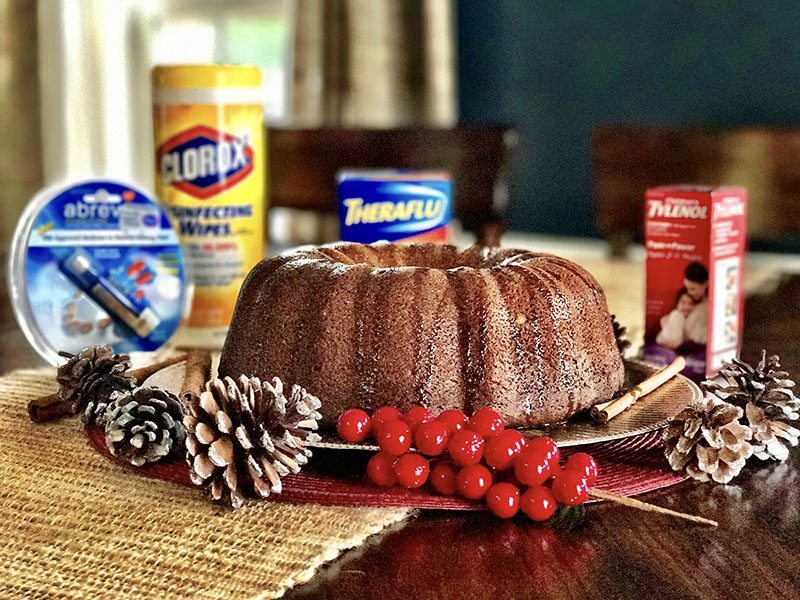 How will you prepare for the holiday and germ season? This looks like a really moist good cake. I should make one. I love eggnog too and haven’t had any this season yet. I don’t have a Kroger near me though. I’m gonna make you one when you come to town! Me and Richard were just talking about that!